My Life and Activities here in KSA..: Mosley wins by TKO over Margarito..
LOS ANGELES (AP)—Shane Mosley dominated from start to finish, knocking out Antonio Margarito for the first time in his career in the ninth round Saturday night to win the WBA welterweight title in a stunning upset. Margarito was coming off an impressive victory over previously unbeaten Miguel Cotto six months ago, and boxing experts had tabbed the 30-year-old slugger one of the top pound-for-pound fighters. But Mosley must not have been paying attention. Despite his advancing age, the 37-year-old Mosley used his superior quickness from the beginning, and Margarito never was able to display the power and fortitude he showed against Cotto. “It was my strategy, my focus, my game plan,” Mosley said when asked what won the fight. It was a tough fight, but it was a great plan. It was my left hook. I caught (Fernando) Vargas with it, I caught (Richardo) Mayorga with it. Mosley brought in Nazim Richardson to train him for this fight, replacing his father, Jack. That move worked to perfection. “When you have a great game plan and an excellent athlete, then everything works out very well,” Richardson said. The bout was held before an announced crowd of 20,820—largest to attend a sporting event at Staples Center since it opened in October 1999. The fans were clearly pro-Margarito despite the fact that Mosley grew up in suburban Pomona, but it meant little once the bout began. “I feel OK. 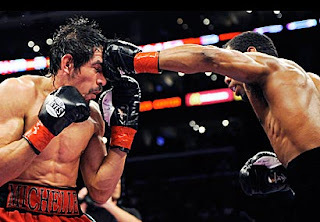 I was just getting caught over and over,” Margarito said. Margarito didn’t win a single round on one judge’s scorecard, one on another and two on the third. The Associated Press had Mosley every round but one. Mosley, who weighed the maximum 147 pounds, raised his record to 46-5 with 39 knockouts. Margarito, known as the “Tijuana Tornado,” weighed 145.8 pounds. He dropped to 37-6 with 27 knockouts after being stopped for the first time. Both fighters earned around $2.4 million.